Animals have been traditionally considered sacred in Hindu culture, The symbolic significance of animals in India are as vehicles of god or deities themselves. Bull, the vahana of Lord Shiva,Tiger the vahana of “Maa Durga“, mouse is also considered as one of the holy animals in India, It is vahana (mount/vehicle) of the Lord Shri Ganesh. Garuda and peacock are considered as the sacred bird of Hindu. In Hinduism snake is representing Kundlaini Shakti and is ornament of Lord Shiva depicting uncontrolled desires which are checked by a yogi. 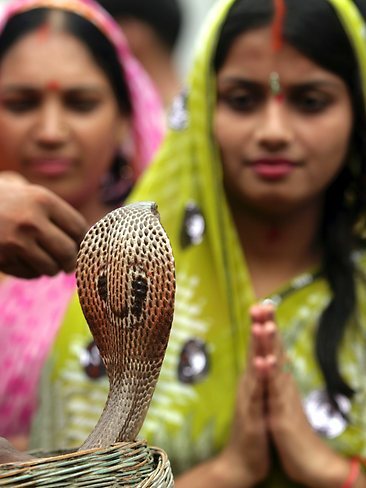 Some people in hinduism worship snakes on Naag – Panchami. Matsya Purana states when depicting Lord Shiva, the Lord should be garlanded with snakes. Most images of Shiva in modern day only depict a single snake around his neck. The five-headed snake forming a canopy over Shivling is another common representation. Puranas and other holy scriptures have numerous tales associating snakes and Lord Shiva. 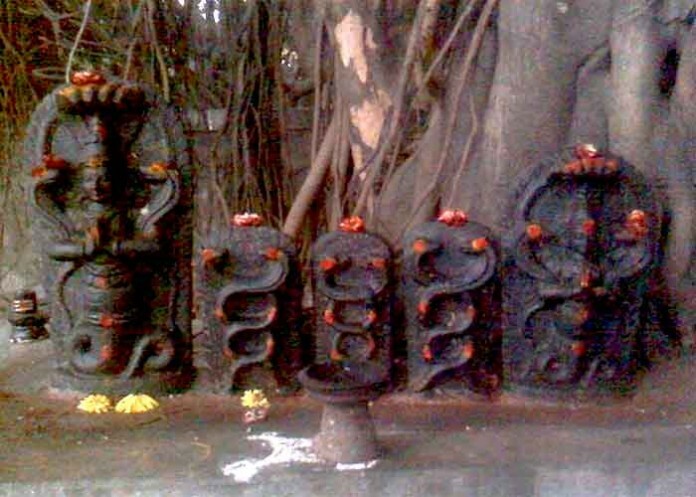 Snakes (Nagas) have been a part of worship in Hinduism from the very beginning. 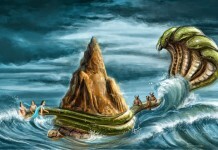 The most famous myth of Lord Shiva’s association with snakes is when he drinks the poison (kalakuda) from Snake Vasuki’s mouth during the churning of ocean to get amrit. From that day, Lord Shiva becomes blue throated and is called Nilakantha.It is said the serpent on Shiva’s neck represent the endless cycle of birth and regeneration. Another symbolism is that the snake on neck represents ego which once controlled can be worn as an ornament. 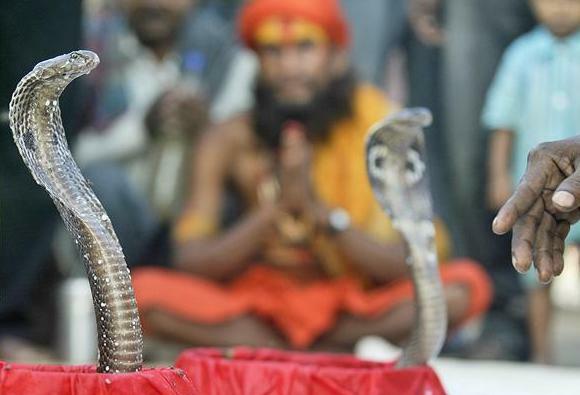 Snake worship refers to the high status of snakes in Hindu mythology which, along with a host of other life forms, appear as vital characters in the Hindu scriptures. Snakes are one of the most sacred animals, second only to the cow. Snakes are associated with Hinduism in their Puranass Snakes like Shesha (Adisesha, Sheshnaga etc) upholds the world on his many heads and is said to be used by Lord Vishnu to rest. Shesha also sheltered Lord Krishna from a thunderstorm during his birth. Vasuki allowed himself to be coiled around Mount Mandara by the Devas and Asuras to churn the milky ocean creating the ambrosia of immortality. Kaliya poisoned the Jamuna / Yamuna river where he lived. Krishna subdued Kaliya by dancing on him and compelled him to leave the river. Lord Shiva also wears a snake around his neck. 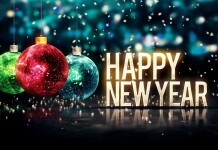 Similarly Hindus worship other creations of God, as we are all benefitted by them and it is our tradition to thank and pray all those who help us and have taken part in our Mythology and Religion. In vedic school (Hinduism) Sarpa (snake) is used to express the flow/wave of Energy. 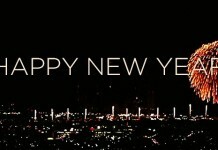 Everything in nature/universe/matter is energy and every matter has its own flow of this energy in its own particular rhythm (vibration).When a thing/matter loses this rhythm/frequency (of its nature) it causes a disturbance in the functioning of matter which can surface as a disease/unease causing disturbance in the natural functioning of a being. These symbols /idols are long route connectors to the same Consciousness, and are one among the choice s given in Vedic school for establishing this connection. This is what it means when Krishna says in Bhagavat gita in which ever form one worships, everything comes to ME (consciousness). This is also the meaning of Shiva being shown in Thapobangi (meditative posture) with snakes all over his body, indicating that a higher flow of energy happens in a state of meditation. It has little to do with the reptile SNAKE other than symbolically show its flow/wave. But since the hindu thought believes in the Oneness of all Creation it worships even the snake as a symbol of this ENERGY. Vasuki is the king of Nagas. Kaliya poisoned the Yamuna river where he lived. Krishna subdued Kaliya and compelled him to leave the river. Manasa is the queen of the snakes. Astika is half Brahmin and half naga. Ulupi is wife of Arjuna, she redeemed him from the curse of the Vasus(Bhishma’s brothers). Their son, Iravan role was pivotal in the Mahabharata war. Historically, we know that the great temples of Angkor in Cambodia were built by Naga descendants. They went from India, intermarried with the indigenous people, and established a kingdom. Nagas were ruled by queens, not kings, as they were matriarchal families. Later on, Kaundinya, a Brahmin king from India, went and defeated the Naga queen. Nag Panchami is the most important Hindu festivals associated with snakes. On this day snakes (mainly cobras) or murtis of snakes are worshipped within temples. 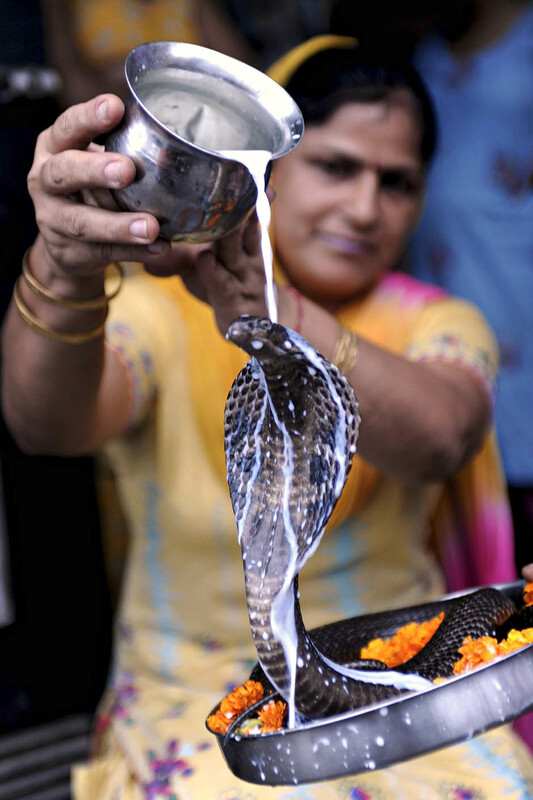 Milk, flowers and incense are offered to these snakes in order to appease the Nagas and seek their powerful blessings. 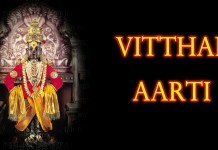 Kalsarp Dosh is a Yogic formation in the horoscopes of people, when all the planets are aligned between Rahu and Ketu. People offer Kalsarp Dosh pooja in order to remove the dangerous ill effects of Kalsarp Dosh.